We offer three types of lodging and three price tiers depending on your accommodations. A standard suite costs $2650 per adult, $1950 per child under 14, $2850 single occupancy. (Please see The Flattops Suite). A private cabin costs $2850 per adult, $2150 per child under 14, $3050 single occupancy. (Please see Columbine Cabin). A premium private cabin costs $3050 per adult, $2350 per child under 14, $3250 single occupancy. (Please see The Longhorn Cabin). To this price add 3.9% tax and 18% service charge which includes gratuity. You can view each of our cabins below. Longer descriptions and pictures of each cabin are below. Cabin availability per week can be found here. Want to ask question about the cabins? No problem, just give us a call at 1-800-967-2401. We are thrilled to answer any questions. Longhorn Cabin is a great place to rest your head at night. One bedroom has a king bed, one a queen and the third has twin beds. The living room also has a queen sleeper sofa. The minimum occupancy for Longhorn Cabin is five people, the maximum is six people. 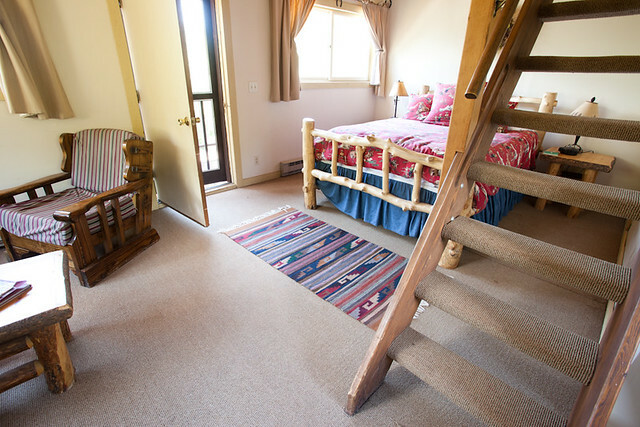 A great mountain cabin, Elk Park has three bedrooms which are outfitted with one king, one queen and two twin beds. Two baths and the living room’s sofa has a queen sleeper. The minimum occupancy for Elk Park Cabin is five people, the maximum is eight. Our newest cabin, finished in 2012. Spruce Cabin has one bedroom with a king, two twin beds in the loft and a twin sleeper sofa in the living room. The minimum occupancy for Spruce Cabin is three people, the maximum is five. Aspen Cabin features two bedrooms with two baths. One king downstairs and two twins in the loft. The living room sofa also features a twin sleeper. The minimum occupancy for Aspen Cabin is three people, the maximum is four. 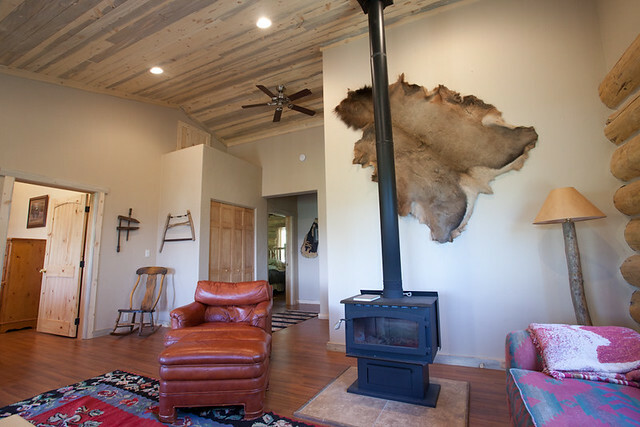 Cozy up in one of our original ranch cabins! This newly remodeled cabin has three bedrooms, two bathrooms and can be split into two separate accommodations, depending on your needs: Option A) Two bedroom, one bathroom with a king bed in one room and two twin beds in the second room or Option B) Studio with a king bed and a private bathroom. This stand-alone cabin is newly remodeled and absolutely beautiful! *If you do not book the entire cabin, we may rent the studio unit separately. Completely remodeled and expanded in 2017, these cabins have a king sized bed in the master suite and a choice of two twins or one king in the second bedroom. These cabins can also be locked off into two separate units. There are covered porches with sitting areas and private entrances on both sides of the cabin. The first unit in our fourplex, Red Tail Hawk features a queen sized bed and a sleeper sofa. Private entrance and your own private bath, it shares access to the hot tub on the deck. The minimum occupancy for Red Tail Hawk Suite is one person, the maximum is two. 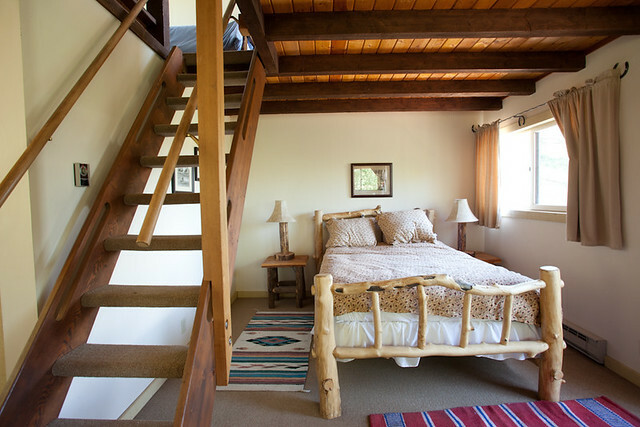 Another great studio at our ranch, Castle Peak features a queen size bed and private bathroom. The studio also has a twin sleeper sofa, with a private entrance and deck access to the hot tub. Pack your bathing suit! The minimum occupancy for Castle Peak Suite is one person, the maximum is two. 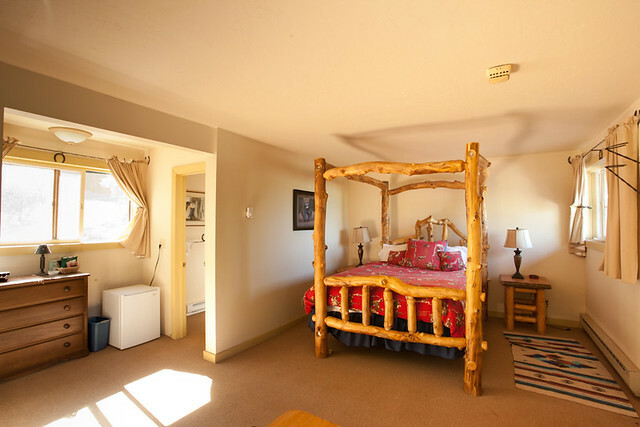 The Longs Peak suite features a queen bed downstairs with a loft that has both a queen bed and two twin beds. Great for a family or group of friends to share. This suite has a private bathroom, private entrance and access to the hot tub on the deck. The minimum occupancy for Longs Peak Suite is two people, the maximum is six. The forth studio, Flattop features a queen bed downstairs with a loft that has a queen size bed and two twins. It also has its own private bath and private entrance, with access to the hot tub located on the deck. The minimum occupancy for Flattop Suite is two people, the maximum is six. Copyright Black Mountain Colorado Dude Ranch. All rights reserved.